The Bf 109-E of Oberleutnant Josef 'Pips' Priller of JG 51, on a hunting sweep over the South of England in the autumn of 1940. Between May and October, Priller claimed 20 kills against the RAF thus earning the Ritterkreuz. He was to become one of the highest scoring aces of WWII with 101 claims. Unusually, all of these were on the Western Front and 68 were against Spitfires! He became famous when with his wingman, flying an FW190 he strafed the landing beaches of Normandy on 6th June 1944, which was the only showing by the Luftwaffe on that day. He led the last major Luftwaffe operation of the war, when he led JG26 in the ill-fated attack on Allied airfields on 1st January 1945. 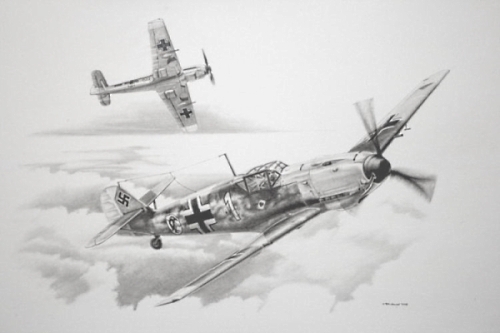 Although upwards of 105 Luftwaffe pilots scored over 100 victories in WWII only three - Priller, Galland and Mayer - achieved theirs exclusively in the Western theatre, making their totals all the more remarkable.